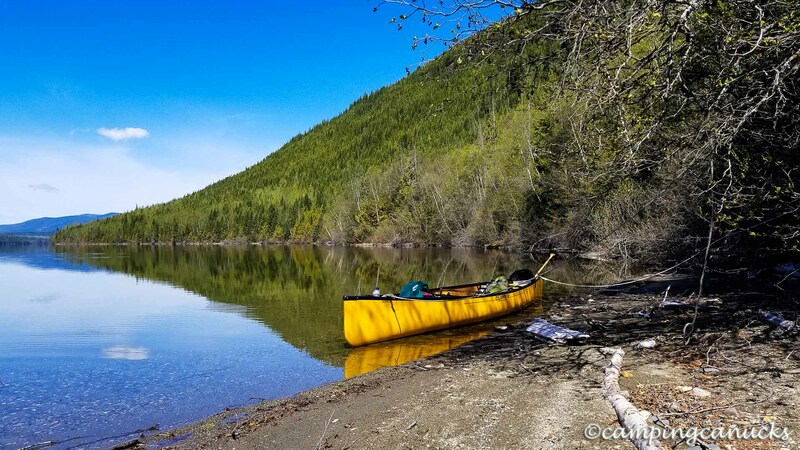 With our history of bad weather on May long weekends, we decided in the spring of 2017 that we would camp and canoe rather than doing a multi-day canoe trip, in order to have an easier time of it if the weather went south. As it so happened, we pretty well had the sunniest and warmest May long weekend that we can remember! 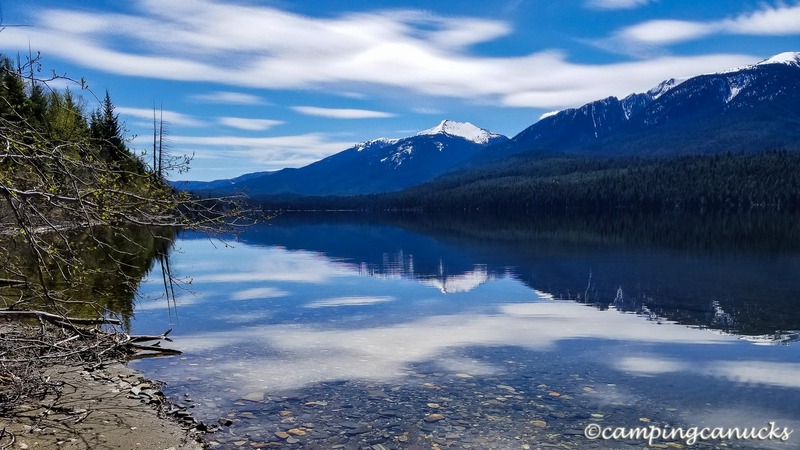 We had made a plan that we would head north of Canim Lake and just wander around the area looking for places to camp and lakes to paddle but we made sure to put Crooked Lake on our list. 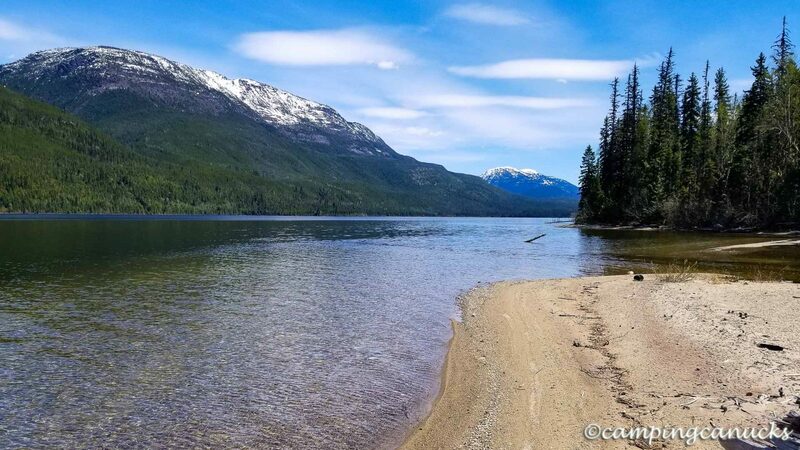 We intended to spend at least one full day at the lake and hoped to score camping at one of the nearby rec sites. We started our camping on the usual Friday after work at the oddly named Paddy Lake Rec Site on the shores of Squirrel Lake, before heading to Crooked Lake the next day. 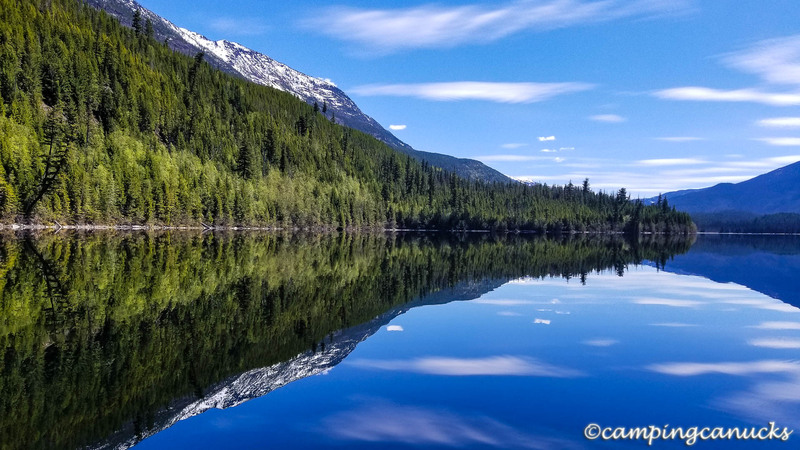 As is usual for the May long weekend, it wasn’t much of a surprise to find the rec sites were completely full so we ended up heading over to the nearby Crooked Lake Resort in search of a place to camp. We were delighted when Kim and Al were more than happy to show us around the resort so that we could pick a choice spot and we’d certainly recommend a stop there for anyone looking for a place to camp at Crooked Lake. 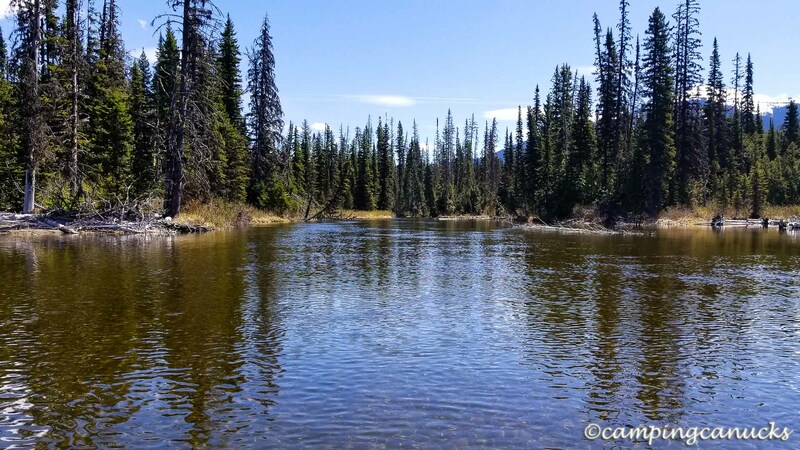 Once we had our camp set up, we did our first paddle of the weekend at nearby Elbow Lake, followed by a nice evening of paddling and fishing on the north end of Crooked Lake. Usually when we paddle big lakes, we’re up early and on the water as quick as we can be in order to beat the windy weather that is a common occurrence on BC’s lake in the afternoons. On this day, however, we had slept in and found that we were only getting underway by mid-morning. 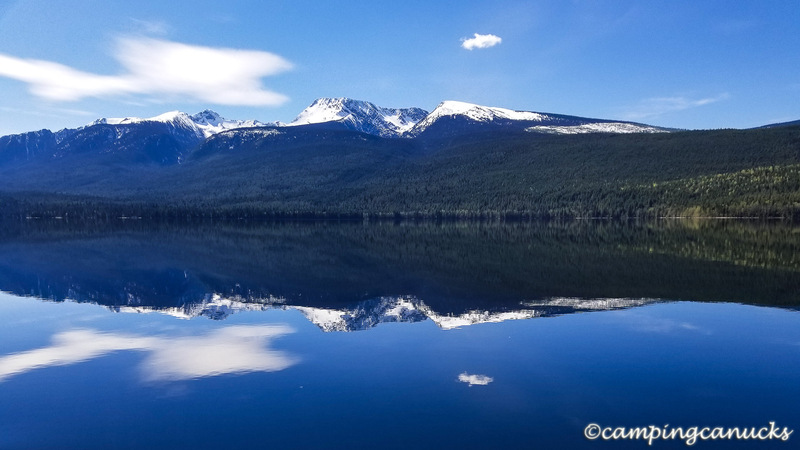 We were amazed at just how calm and clear the lake was as it seemed more like a mid-summer day than a May weekend! Our intention was to just paddle the circumference of the lake, which we estimated would be about 20 km, and so off we went on our way down the eastern side of the lake. For a little while another canoe was following us, but they didn’t go very far and we soon found we had the lake to ourselves. Once we were out of sound range of the campgrounds, it suddenly seemed as if we were far away from everyone. Needing a break after a couple of hours of paddling, we looked for the next good spot to pull out. With the water being as high as it was, though, it did take a bit to find a sandy section to stop at as there wasn’t a lot in the way of beaches to be found on the eastern shore. It was also a good time to shed some layers as the day was becoming quite warm. After fueling up, we put back on the water and continued on down to the end of the lake, still marveling at how great the weather and conditions were. We were kind of regretting not packing along camping gear and finding a spot to stay on along the lake. Within a couple more hours, we reached the end of the lake and found a large stretch of beach where we stopped for a break. We could see fresh moose tracks in the sand that must have been put down only hours before. We also found two memorials placed in remembrance of two people’s lives placed a little ways back in the forest. Once back on the water, we paddled a short ways up the in flow, McKusky Creek, before making our way back up the western side of the lake. We soon determined that much of the sandiest parts of the lake are on the west and we found a number of good places to camp. Someday, we will have to come back and spend a night out on this lake. Aside from a couple of kayakers we came across on our way north, we didn’t see another person for much of the day as we finished making our way up and around the north end late in the afternoon before pulling back into the resort. 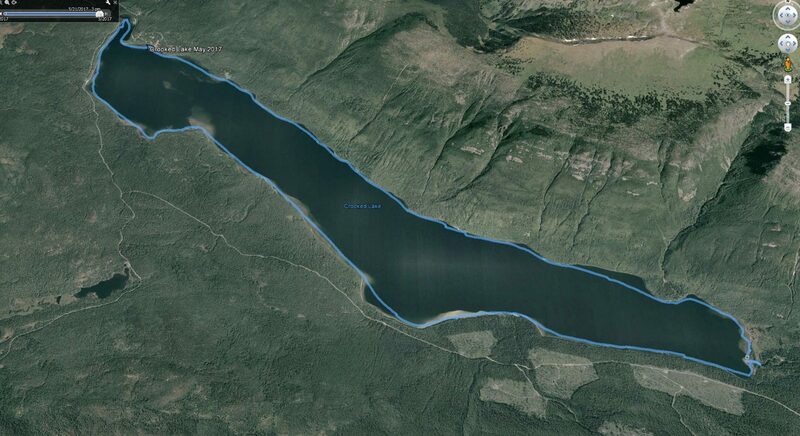 All told, we paddled just a bit under 24 km. 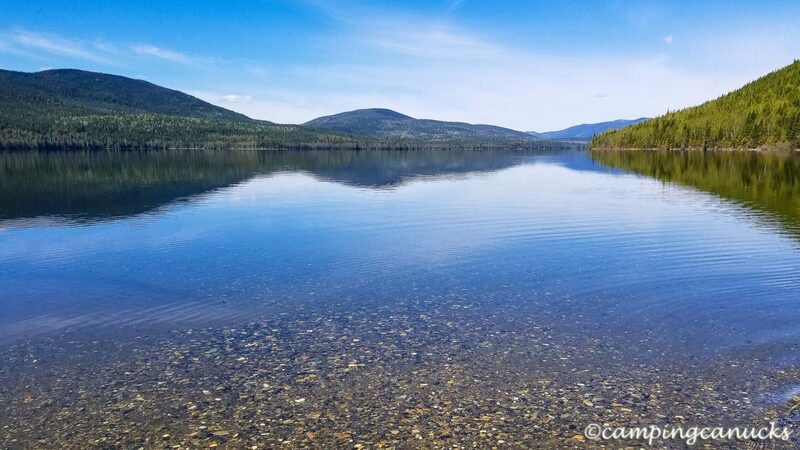 Paddling around Crooked Lake was most definitely the highlight of our weekend and we were glad that we had taken a chance and made our way to this lake. 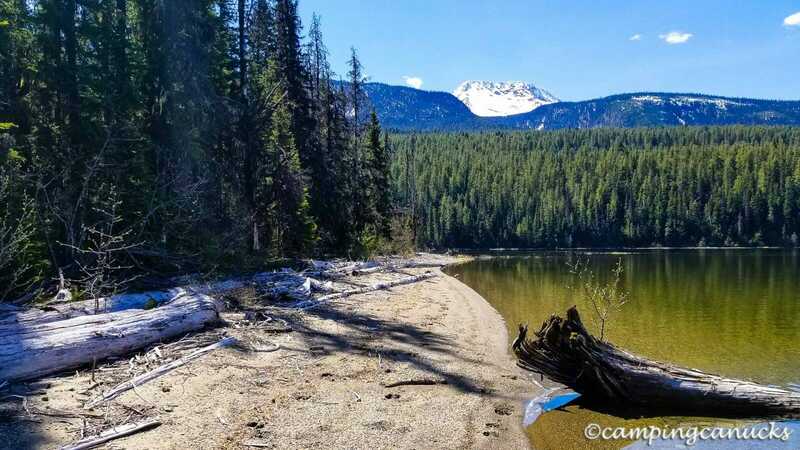 Of course, perfect spring weather makes for a great day on almost any lake but there was something wild and remote about Crooked Lake that made for an excellent day of paddling. We’d recommend it to anyone looking for a day trip or to spend a night on its many lovely beaches. Great Travelogue! Nice to experience vicariously the beautiful lake.